The spicy, piney, tropical complexities of Chinook, Mosaic and Simcoe hops hit you right away with their dank aroma—and they stick around. 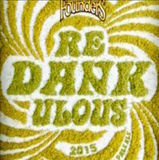 reDANKulous Imperial Red IPA is a no frills, bold 9.5% ABV India Pale Ale. It pours a pleasing burnt amber with some sweetness due to the Caramalt and roasted barley used in the malt bill. But hops are the true headliner in this elaborate sensory experience. Take a sip to have your palate simultaneously walloped and caressed in all the right places. Combined, the hops take the beer to 90 IBUs. It’s not just ridiculous. It’s reDANKulous.